They failed in mine... quite in a good way actually. First cannon hit damaged part of the plane + 1 engine. Then a missile destroyed everything and I crashed that way. Can it be an issue regarding the FG version? It'll pop up a message on the top of your screen saying the engine failed, but it doesn't actually fail the engine. Can someone turn my dream into reality?????? "A superior pilot uses his superior judgment to avoid situations which require the use of his superior skill". Commander of Apollo 8 . I agree, a decent Tornado would be nice. Not to offend anybody, but I don't want to make it though. I entirely approve of the drone idea. Enrogue (I think) seems to have some existing drone-related work (see the target drone). Perhaps some reuse of code between the MQ-9 and the other drone effort will provide some interesting capability and reduce duplicate work. Yeah, some days ago I also found out that it can drop bombs and fire missiles fairly well and realistically. If the whole thing could be improved, it'd be awesome. It's not the latest version, but here is it (found it by searching on Google). EDIT: Probably it's the latest. Anyone still have a copy of this version? I can't find it on the interwebs anywhere, and mine got deleted on accident. EDIT: found a zip file, we're good. I found the very latest version for both 3.4 and 3.6+ of the Eurofighter Typhoon. Working on getting the Eurofighter OPRF compliant. The upside is that the files are laid out a LOT like the Mirage - one of them sort of copied the other. They share a lot of nasal code. The downside is that the radar wasn't playing nice with our guided missile code, so I'm having to do a lot of work there. But, when it's finished, it should be fairly cross-compatible with the Mirage, so less work there. I don't plan to support this plane in the super long run - just get it up to spec and let it go so we can have a tad more variety. Update: Had a successful missile firing. Need to get a couple more radar-related things fixed, such as shown distance and a reticale on the hud, then do the FCS work. edit: radar issues solved, holy crap i need to go to bed. A/A missiles work, damage works, blackout works, radar (hide-behind-terrain) works. Only thing left is the FCS. FCS is making me grumpy. It's def a complicated system. This may take a while. Another update - I managed to limit the g forces to +9/-3. It's nice that finally we're going to have another alternative for fighting/bombing. Thanks Pinto for working on it. If this works (I really hope so) it will be applicated to C-17, UH-60 (FGUK), U-2S and V-22. EDIT: What about the MiG-29? Any possible works on it? Re: the MiG-29, just takes someone to work on it. I don't remember what state it's in currently off the top of my head though. 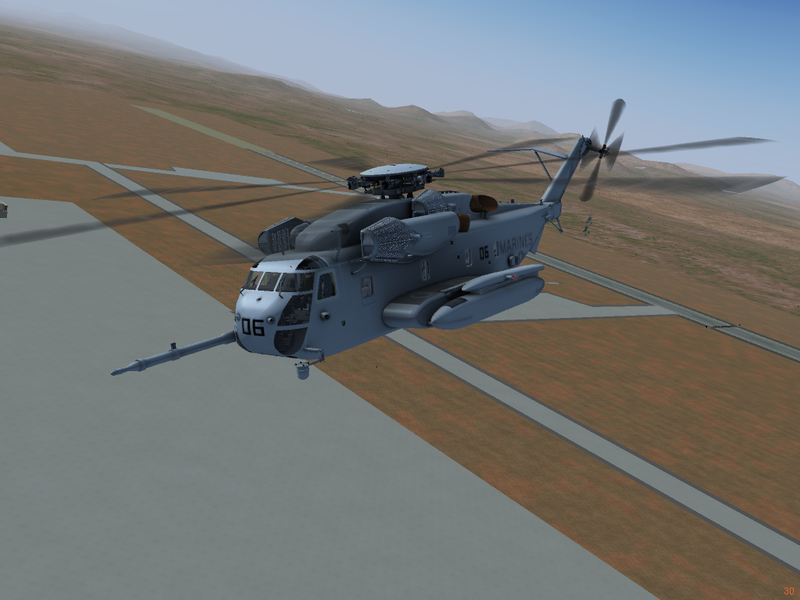 The CH-53E doesn't work correctly, seems like the code I've added makes it loose somehow power and crash. I really need these few lines of code fixed one time forever regarding how to make engines fail in YASim 'cause I'm angry about not being able to do it myself. The MiG-29 needs radar (I think) and a working weapons system. It has a JSBSim FDM (a few tweaks maybe?) so damage code fits just fine. It's another really nice model BTW (said by someone who doesn't like Russian stuff). Re: YaSim, almost every YaSim plane does their engines differently, so it'll have to be different for every YaSim aircraft it's added to. At least, in the 5 or so ones that I've done, that's how it's been. And it hasn't been easy in the least. Re: MiG-29, go for it. I'm drowning in my other project right now that has to be priority, as I'm on a schedule. And I have a backlog of other stuff I have to get done. I'm actually considering just finishing up what I have going on, and spending time supporting and improving those. I have big dreams about how to make the drone amazing and actually worth fighting against that I'd like to tinker with.